Poor Lenovo. HP co-opted its contortionist laptop design in February with the Pavilion x360, and now Toshiba is introducing a Yoga copycat. The Satellite Radius is a 15.6-inch convertible with a 360-degree hinge that offers five usage modes: Laptop, tablet, presentation, audience, and tabletop. No, it’s not an oversized Yoga. 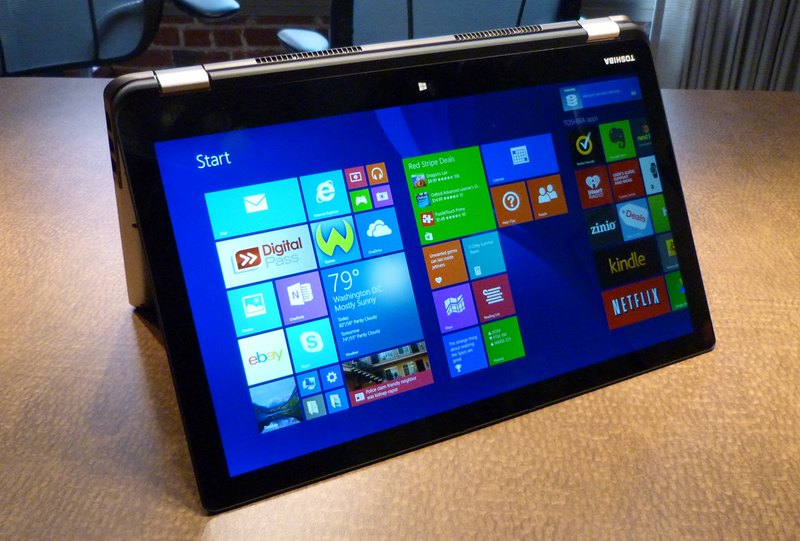 Toshiba’s Satellite Radius is a 15.6-inch laptop that can flip and fold just like Lenovo’s consumer flagship. The Satellite Radius will feature an aluminum enclosure and will be available with either an Intel Core i5 processor and a 750GB hard drive for $926, or a Core i7 CPU and a 1TB drive for $1049. Both models will come with 8GB of memory, LED-backlit keyboards, and 802.11ac Wi-Fi adapters with support for Bluetooth 4.0. The IPS display will offer native resolution of 1920x1080 pixels. Holding this 4.85-pound computer in tablet mode is a tall order. I imagine most people will cradle it in the crook of one arm, if they use it tablet mode at all, because it’s just too heavy to hold any other way. But the large display will be terrific in “presentation” mode (with the laptop set up like a tent) and “audience” mode (with the keyboard facing down and the display at a right angle to it. Cowan told me a “smart-lock” feature can be configured to turn the keyboard off when it’s not needed. That’s a lot of machine to fold into a tablet. The convertible weighs 4.85 pounds. Toshiba will bundle a copy of Nuance’s Dragon Assistant with the Satellite Radius, which will have dual-array microphones embedded in its bezel. The convertible will be equipped with Harman Kardon speakers and DTS Sound audio-processing software. Cowan said the Radius will be available in July at Best Buy and directly from Toshiba. 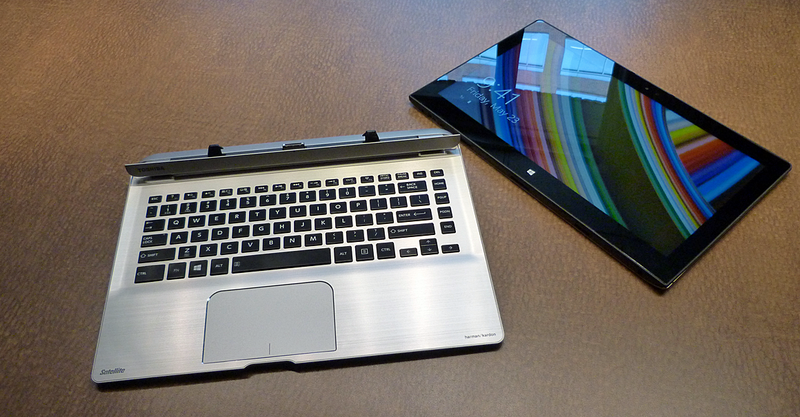 Toshiba also showed me two new notebooks with detachable displays. “Detachables have been out of reach for the average consumer,” said Cowan. So Toshiba will price the budget-oriented Satellite Click 2 at just $587 when it ships in July. That will buy you a 13.3-inch IPS display (with native resolution of 1366x768 pixels) that can detach from its keyboard dock to become a tablet. Toshiba’s Click 2 detachable gets a new button-free docking mechanism. A new docking mechanism eliminates the need to push a button or slide a catch to release the display: You simply push down on the top edge of the display and pull it away from the dock. The prototype I saw last week didn’t work perfectly—one side kept getting stuck—but you can’t expect prototypes to be perfect. Cowan said the combo will be 0.9 inches thick and tip the scales at 4.85 pounds , while the tablet on its own will measure 0.55 inches thick and weigh 2.81 pounds. The Click 2 will be entirely passively cooled, but I don’t imagine it will be a barn-burner when it comes to benchmarks, being powered by a Bay Trail-class CPU (a quad-core Intel Pentium N3530) and 4GB of memory. Storage will come in the form of a 500GB mechanical hard drive. On the upside, it will come with an 802.11ac Wi-Fi adapter and an HD webcam. Toshiba partnered with headphone-maker Skullcandy to engineer the Click 2’s audio subsystem. Since the drive resides in the tablet half of the duo, Toshiba is including its own impact sensor software that moves the read/write heads away from the platters when it detects vibrations that might jeopardize data integrity. Toshiba collaborated with headphone manufacturer Skullcandy to design the Click 2’s audio system. Cowan handed me a pair of Skullcandy’s Crusher headphones for a quick listen, and the cans literally vibrated in time with the bass beat. I doffed them in short order, but I’m clearly not the target market (for the record, I don’t think much of Beats headphones, either). 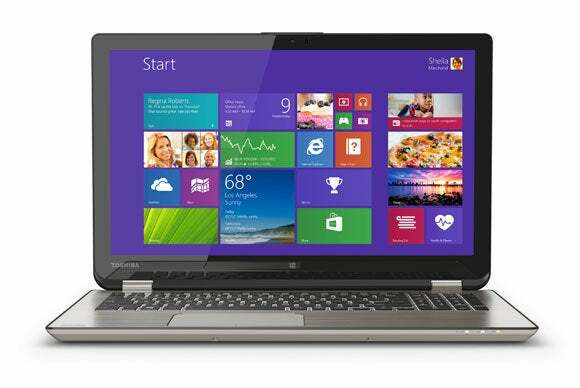 Toshiba’s Satellite Click 2 Pro will be more of a performance play. It will be offered in two configurations, one of which will feature additional storage and a second battery in its keyboard dock. 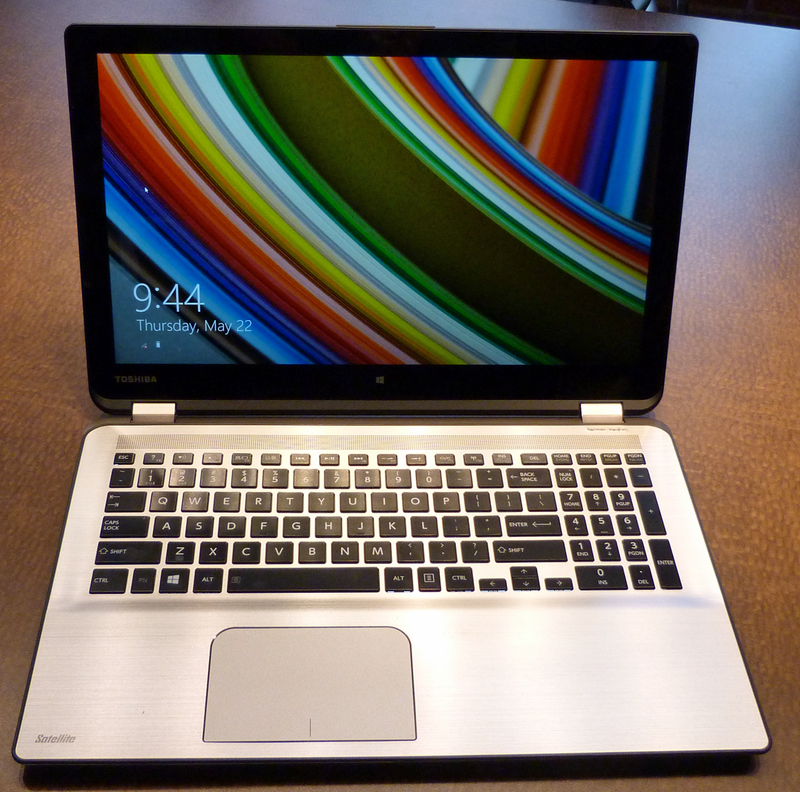 Cowan said Toshiba expects the Click 2 Pro will last around 9.5 hours with both batteries. Like the Click 2, the Click 2 Pro will have a 13-inch IPS display, but the native resolution on this model will jump to 1920x1080 pixels. Like the less-expensive Click 2, a push-down-to-release mechanism connects the display to its keyboard dock. 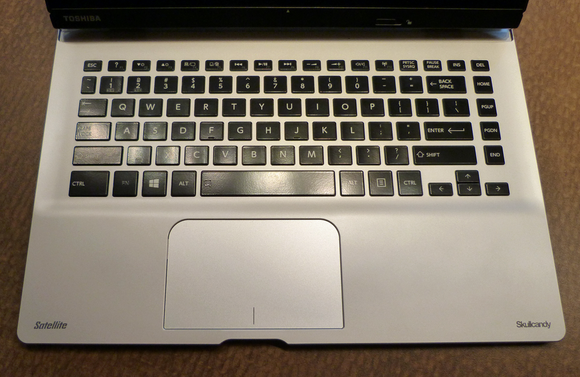 The Click 2 Pro will have a detachable 13-inch IPS display with native resolution of 1920x1080 pixels. The Core i7 model will have a second battery and hard drive in its dock. The Click 2 Pro will be available with either an Intel Core i5 CPU and 4GB of memory for $1029, or a Core i7 processor and 8GB of RAM for $1280. Both configurations will come with a 128GB SSD and an 802.11ac Wi-Fi adapter, but the Core i7 model will come with a supplemental 500GB hard drive and a second battery in its keyboard dock. Those prices are considerably lower than the $1799, business-oriented Portege Z10t I reviewed in April. The Click 2 Pro will also have more ports than the Click—including a micro HDMI port and dual cameras in the tablet half of the equation. Toshiba tapped Harman Kardon and DTS to help design the audio system in the Click 2 Pro. 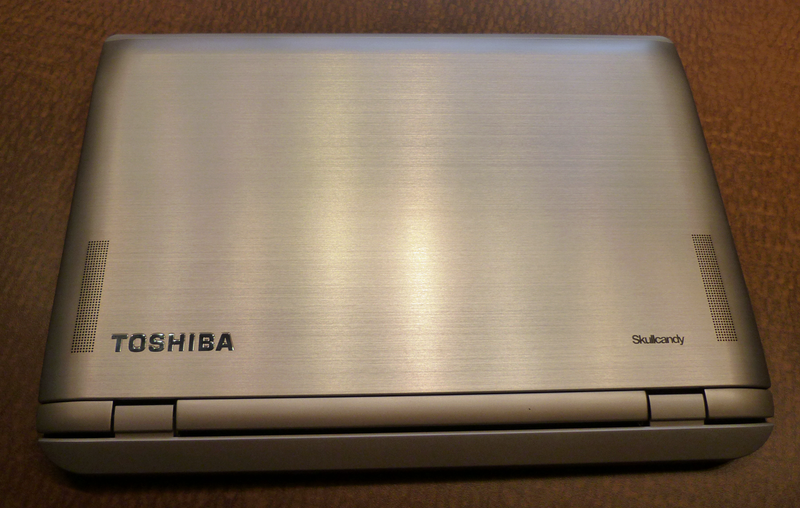 Toshiba expects both configurations to be available by the end of June.